Each LOVE trip focuses on relevant social justices issues facing the communities that students are visiting. The Lasallian Outreach Volunteer Experience (LOVE) provides service-immersion experiences where students spend a week during school breaks learning about social justice issues facing communities domestically and abroad. LOVE gives you the opportunity to learn about the local culture by experiencing it firsthand. As a participant, you'll live and work alongside members of the community, hearing the stories of local community partners who are working to create change in their communities. You'll learn about the challenges the community faces, and gain new perspectives on current events. You'll eat local cuisine, partake in traditional customs and be encouraged to step outside of your comfort zone. Meeting Jaspers from different walks of life is one of the best parts of LOVE. During weekly meetings and fundraising events, students build relationships with their peers on the team, student leader and advisor. Students foster an inclusive community where all team members feel welcome, included and comfortable discussing their sociocultural identities and sharing their insights. The friendships developed through LOVE are truly unique, and tend to last throughout college and beyond! Students of any spiritual or religious background (or none) are welcome to participate in LOVE. Leading up to and on their experience, students will engage in group reflection to help process their experiences. 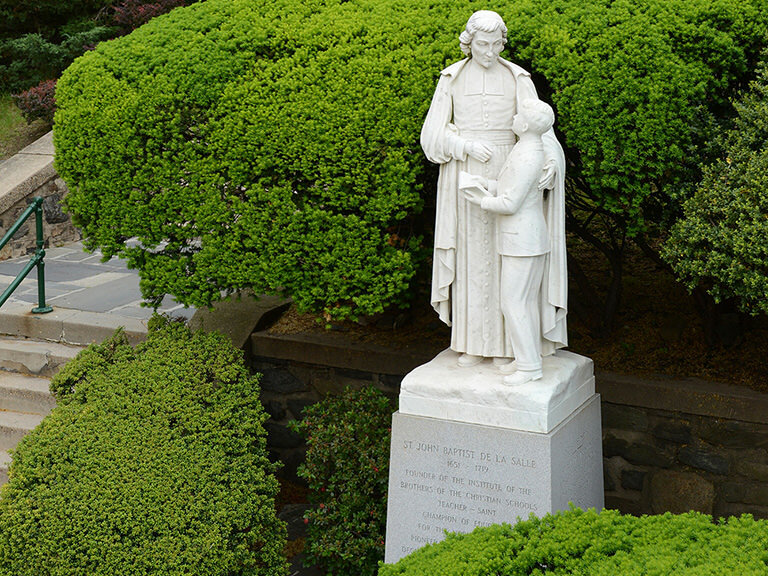 Students are introduced to the Lasallian charism and are Students are encouraged to explore their spirituality from the context of their own faith tradition. Throughout the trip, students are encouraged to lean into the experience fully through practicing simple living. Students forgo technology (cell phones, large cameras) to spend time in quiet reflection and self-discovery. Participants pack concisely and stay in simple accommodations on their trips to gain a better understanding of the experience of those who live in the communities they visit. Students are asked to be conscious of their actions and impact in the community as well as taking photographs in an ethical and appropriate way. Learn more about LOVE at Manhattan College from students who have had life-changing experiences participating in the program. LOVE service immersion experiences take place over Winter, Spring & Summer breaks in locations both domestically and abroad. Working with United Saints Recovery Project, the group will continue to help with the rebuilding of homes destroyed or damaged in Hurricane Katrina. 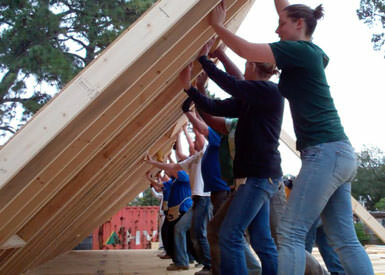 While in New Orleans you will help out with hands-on rebuilding projects such as roofing, painting, etc. You will meet with representatives from various community organizations that work in the community to hear their stories and experiences. You will also learn more about the social justice issues that are associated with the disaster of Hurricane Katrina as well as the recovery efforts. Rostro de Cristo’s mission is to provide spiritual and educational opportunities in Ecuador. The program invites participants to live simply, build relationships with the Ecuadorian people and reflect on the Face of Christ in their joys and struggles. Participants will learn about the internal migration taking place in Ecuador because residents are searching for access to resources in the cities, which has led to the creation of “invasion communities”. The idea is not to do for but be with the people of Duran. El Otro Lado (EOL) El Paso, is a Lasallian border immersion experience which centers on going “beyond the borders” of our consciousness to get a better understanding of those living along the margins. EOL is an immersion program that exposes participants to the many issues related to border realities such as; immigration, unaccompanied minors, youth at risk, political asylum seekers, human trafficking and the complex cultural dichotomy of the El Paso and Ciudad Juarez borderland. Participants learn about the unique culture of El Paso and Ciudad Juárez, interact with people in the borderland, listen to their stories, and share in the experiences of their day-to-day lives. Representatives from various organizations from both sides of the border such as Border Patrol and grassroots organizations will be hosting different sessions throughout the week to give participants and overall picture of the borderland. The Firestone Center organizes service immersion experiences where students will be exposed to issues of urban poverty, education, homelessness, economic justice, racial justice, as well as the impacts of the water crisis in Flint, Michigan. Students will encounter these issues through community building and service at local community partner organizations in the city. Participants of LOVE Montana are immersed in life on the Blackfeet Native American Reservation and De La Salle Blackfeet School. Participants will engage with students at the De La Salle Blackfeet School, spend time with De La Salle Christian Brothers and Lasallian Volunteers, and learn about the Blackfeet culture. This trip will give participants an opportunity to be immersed in this culture and learn about ways in which poverty affects this community, as well as the resilience of this community. Participants will also engage in evening reflections throughout the experience and hear speakers from the Blackfeet community talk about their challenges and the uniqueness of their culture. Mustard Seed Communities serves over 500 children, young adults, and families who belong to the most vulnerable groups in Jamaican society. The populations in Mustard Seed homes include children and young adults with disabilities as well as children affected by HIV/AIDS. MSC Jamaica also manages a number of community outreach programs to combat poverty and provide education to local populations. Participants will gain a greater understanding of justice issues of poverty, access to healthcare and disability through immersion in the daily life of the Mustard Seed community. Participants spend one week in the Holy Land learning about the rich culture of the three major Abrahamic religions. Participants will visit two schools of the De La Salle Christian Brothers, the Freres Lasallian School in Jerusalem and Bethlehem University in Bethlehem. Students will have a chance to meet with faculty and students to learn about their work, lives, and relationships they have established with the communities there. Participants will also meet with Catholic Relief Services and see firsthand the work they are doing with communities in Palestine. Participants will also meet NGOs like Catholic Relief Services and local community based organizations to see firsthand the work they are doing in their communities. 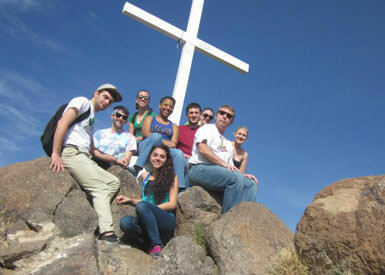 Students live and work at a retreat center in El Cercado. You will work with community organizations focusing on health, agriculture and education. San Pedro y Pablo organizes and empowers a network of faith based communities. Together they organize themselves and work to enhance education, protect natural resources, illuminate their self dignity, advocate for social justice, and promote equality and basic rights in their community. The Brother David Darst Center provides transformative urban immersion experiences in the Lasallian tradition. 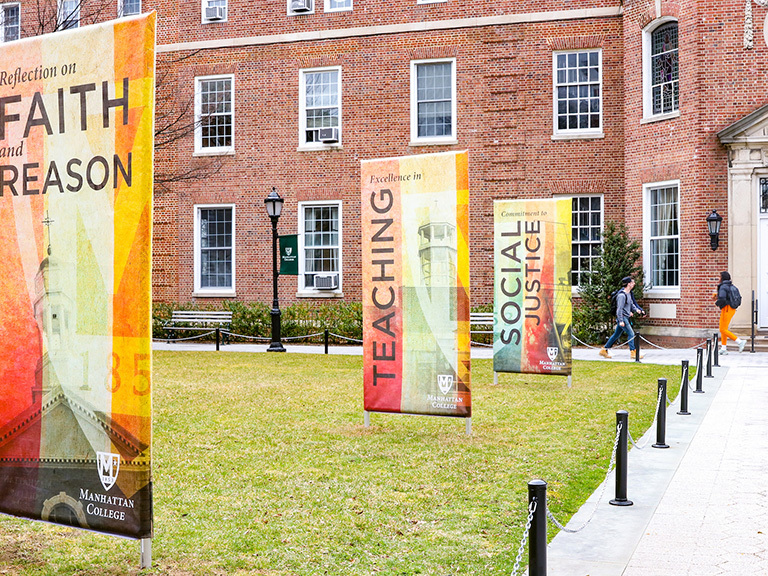 The experience allows students to explore issues of justice and the reality of oppression. Through partnerships with local agencies, participants are able to get to know people, to challenge stereotypes, and be open to new experiences. As a participant, you are fully immersed in urban life, and address core issues such as homelessness and poverty. This trip is a great way to see the social injustices that are prevalent in American cities and reflect upon the root causes. BorderLinks offers experiential learning opportunities that explore the challenges of migration and life along the U.S./Mexico border. BorderLinks provides an educational program focused on exposing participants to a wide range of topics from border history to action planning for social change. Participants will listen to many different voices and hear the stories of people who are impacted by border and immigration policies in a variety of ways. Students will be encouraged to think critically and intersectionally about solutions to the root causes of migration. On LOVE Florida, you have the opportunity to engage with migrant farmworker families at the La Salle Educational Center in Homestead, Florida, outside of Miami. Participants will share meals with residents of the community and hear their stories. They will also meet with community partners engaging with issues of immigration, farmworkers rights, and food justice in the local community. In the afternoons group members will serve the after school program through providing tutoring and recreational activities for the students. Visit the Inside Manhattan website to learn more about how current Manhattan College students can apply for a LOVE trip. Sign up to receive information about applying to Manhattan College and how you can go on a LOVE service-immersion trip.